Several preceding posts (here, here and here) had described the change in healthcare-associated MRSA (HA-MRSA) clones in the local setting, and either the SGH Diagnostic Bacteriology blog or I (or both) will probably write on community-associated MRSA clones in Singapore in the near future. But from a practical point of view, does it really matter whether it is ST239-MRSA-III or ST22-MRSA-IV or ST30-MRSA-IVc or ST-whatever-number/SCCmec-whatever-Roman-numeral? After all, from a clinician’s perspective, the infections caused by different MRSA clones are all treated with vancomycin (there are more – mostly more expensive – options nowadays of course, like daptomycin or linezolid or ceftaroline). How well this question is answered will also determine the practical applicability of molecular typing techniques. There are 3 separate points to consider here, which should ideally be combined into a single perspective on the matter of the practical relevance of different MRSA (or other bacterial) clones. If one clone was more virulent (defined as being more invasive or able to cause more severe disease) than another, then all things being equal, it would be better to be rid of the more virulent clone. CA-MRSA are sometimes considered more virulent than HA-MRSA because they are able to cause disease in young and healthy individuals, whereas HA-MRSA mainly causes disease in more immunocompromised patients, especially those with compromised skin/mucosal integrity (i.e. post-surgery or those with venous catheters/endotracheal tubes. We had previously looked at a small cohort (n = 228) of inpatients at SGH with MRSA bacteraemia in 2005, and showed that there was essentially no difference between the rates of death (mortality attributable to MRSA infection – which is no longer popularly used nowadays because of the high risk of bias) or risk of complicated infection (a research term defined as the development of new site(s) of infection away from the original source of bacteraemia) for inpatients with either ST239-MRSA-III or UK-EMRSA-15 blood infections. A minor digression – I remember comprehending for the first time how high the death rate for MRSA bacteraemia was (26.3%), despite best available medical care. Such a statistic was not immediately obvious from just managing patients’ infections on a case-by-case basis. But death from bacteraemia is only one aspect of virulence. From the middle half of the last decade, there have been a few outbreaks of MRSA infections (mastitis and breast abscesses) in new mothers who had given birth at both private and public hospitals in Singapore, and there have also been outbreaks among the neonates who have either been colonised or infected by MRSA. The initial suspicion was that these were CA-MRSA infections, but they have virtually all turned out to be infections caused by UK-EMRSA-15. Such outbreaks are rare for ST239-MRSA-III, especially among healthy young women that had just given birth: the last such publicly reported outbreak occurred at the KKH neonatal ICU in 1994 (not exactly healthy neonates! 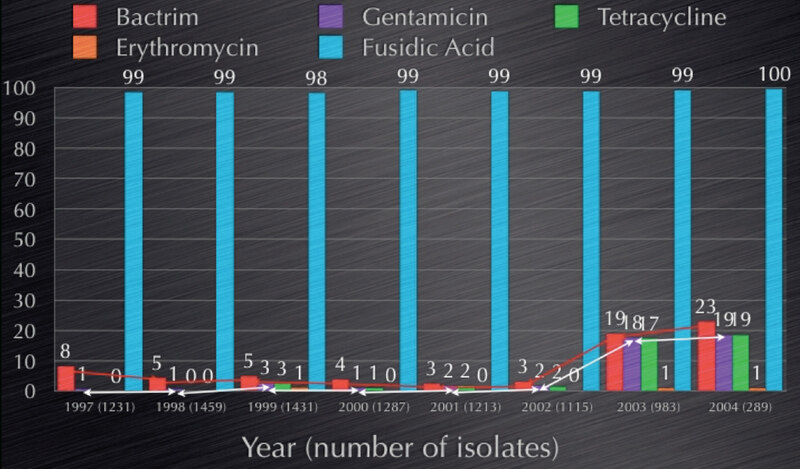 ), at a time when ST239-MRSA-III had the “monopoly” on HA-MRSA infections in Singapore. The other important factor is transmissibility, or “infectiousness”, of a particular clone of bacteria. Even if one clone was somewhat less virulent than another, but if it transmitted better and spread more easily among people, it might be worthwhile to expend more effort in trying to limit its spread compared to the more virulent but less transmissible clone. Conversely, the same infection control measures that could contain the less transmissible clone might not be successful with more transmissible clone. Here, it is clear that UK-EMRSA-15 is far more transmissible than ST239-MRSA-III. Besides the example above (where UK-EMRSA-15 was able to spread among nursing mothers and neonates more easily than ST239-MRSA-III), we also found in the rare events when healthcare staff were screened (such data are unpublished) that the majority of staff colonised with MRSA had UK-EMRSA-15 rather than ST239-MRSA-III. 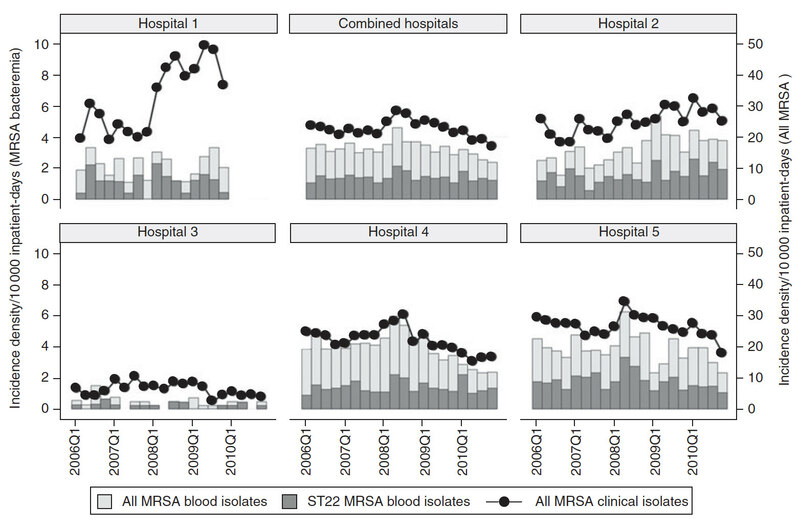 Finally, the step up in infection control efforts in several local hospitals between 2007-2010 did not reduce UK-EMRSA-15 rates as much as they did the other MRSA clones (this is a bit hard to appreciate in the figure below, where the dark bars represent UK-EMRSA-15). The original article is unfortunately behind a paywall. MRSA incidence-density in local public sector hospitals. Dark bars represent UK-EMRSA-15. Note that although MRSA rates fell in many hospitals from 2008, UK-EMRSA-15 rates were not significantly affected. This is more important for clinicians. But obviously more choice in terms of antibiotic prescribing can only be good. ST239-MRSA-III is the clear “winner” in terms of antimicrobial resistance. In the bad old days, the only options other than vancomycin were rifampicin (which cannot be prescribe alone in view of peri-treatment development of resistance) and fusidic acid. The bug was just about resistant to everything else. UK-EMRSA-15 was a more antibiotic-sensitive clone, being virtually always sensitive to the aminoglycosides, tetracyclines and cotrimoxazole in addition to rifampicin and fusidic acid. This distinction is less important today where there are far more anti-MRSA drugs available, including linezolid, daptomycin, ceftaroline and tigecycline among others. A somewhat overused figure, showing an increase in antibiotic susceptibility among MRSA that heralded the rise of UK-EMRSA-15. There is no doubt in my mind that having local knowledge of the circulating MRSA (and other bacterial) clones is important, as is being able to quickly detect the emergence of a new clone. This has bearing on both infection prevention as well as public health in the long run.